There will be cynics out there who will dismiss this movie as another reach for your wallet, simply because of our love of Liam Neeson. I am as guilty as the next person of perpetuating the chain of Neeson badass characters showing up in the first part of the year and giving us some meaningless action pieces. "Unknown", "Taken 2", "Non-Stop", and "Taken 3" are all about an inch deep and are really just an attempt to allow Liam to play a hard case. The storytelling in those movies is not well thought out and the action is usually shot in a manner designed to give us a memorable moment with Liam Neeson with a gun in his hand. While there is a moment like that in this film, the rest of the movie strays far from the formula and builds a real story around a sad character that we should have no sympathy for but who ultimately tries to redeem himself for his son and for all of us watching. 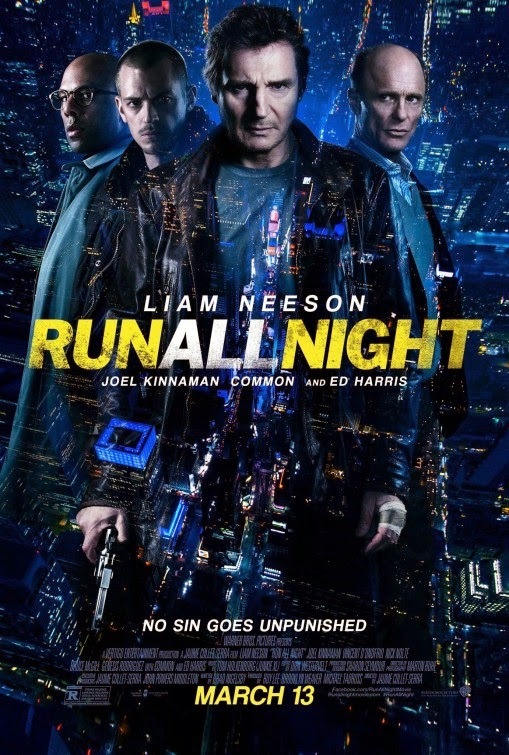 "Run All Night" comes much closer to the great Neeson action films of the last few years; the original "Taken", "The Grey" and last years criminally under appreciated "A Walk Among the Tombstones". Like those films, his character's weaknesses are developed as part of the story, not just laid on to create background. His character, Jimmy Conlon, is a mob enforcer formerly known as "The Gravedigger". Jimmy's fortunes have fallen by the wayside as he drowns his nightmares in drink and sloth that barely keep him alive. His best, friend and former employer makes sure that he is taken care of but no longer entrusts him to do the dirty jobs he was once responsible for. That friend, Shawn McGuire, played by Ed Harris, no longer needs that help because his business is more legitimate and less violent than it once was, at least until his son Danny tries to make a name for himself in the rackets. If you have seen the trailer, you know the set up of the movie and it looks like it will be standard action killings for a couple of hours. There are indeed several action sequences and a lot of people get dead, but unlike the disposable types of perfunctory death that Neeson's characters usually provide, these all take a toll on him one way or another. As he attempts to protect his son, Jimmy is forced to confront his legacy as well and it is not a pretty picture. Neeson plays a real character here not simply some automaton that walks through the door with guns blazing. The strained relationship with his son makes the process of trying to protect his boy more difficult. The fact that he understands his enemy so well because he once was that enemy is a slap in the face for the kind of person he has been most of his life. Ed Harris give a very strong performance in the film as the conflicted best friend and boss who now wants to make his former associate suffer for what are really his own faults as a father. He knew his kid was a bad seed, but he loved him. The tough love he tries when Danny attempts to build a drug kingdom, is directly responsible for the death of his son. No one will be able to accept that when he can put the blame on a boogie man that he helped create. Jimmy and his son Michael (Joel Kinnaman), become the fall guys for McGuire's own faults. Everybody knows this except Michael, the grown son of Jimmy with a young family of his own and the good sense to stay away from his father's old life. When Michael tries to do the right thing, it leads to all hell breaking loose. Some cops are crooked, old haunts become dangerous and old friends want to kill the father and son. Reason was never a strong suit with these characters and there is no way of making this right. Ed Harris just received a Star on the Hollywood Walk of Fame, and it was timed to go with this films opening. He can be proud that his work here is more vital than some of his recent efforts like "Snowpiercer". Even though it is a well told story, there are still a few trite elements that are inevitable. Michel's family is in jeopardy so there will be scenes of them being stalked. The father-son dynamic is stress filled so there will be some defiance of orders/advice given by a criminal to his honest as the day is long son. An implacable hitman is put on the job to dispose of the pair, regardless of the fact that Shawn already has nearly two dozen guys and insiders in the police department working on the task. So if there is so much SOP in this movie, why do I see it as being so much better than the rest of these films? One reason is that there is a side story of a dedicated but frustrated cop who knows what Jimmy has done in his life and he still wants answers for those who have been gone for years. Vincent D'Onofrio is the weary but dogged honest cop who could be a key to saving Michael, if Jimmy plays it straight. An uncredited big name shows up for one scene and delivers a heart rending piece of information that makes it even more impossible for Michael to trust his Dad. There are also good supporting performances from the thugs and victims of the story. Whenever Bruce McGill shows up in a movie, it gets a little better, I only wish he had more to do in this. The director Jaume Collet-Serra, who made "Non-Stop" and "Unknown" with Neeson before, has a much better story here and he uses the camera and the city of New York in an interesting way to tell it. Ultimately though, it is the story arc of Jimmy that makes this work. He is legitimately troubled by his past but lives through it in daily misery as a penance for what he has done. He never sees this as a chance to redeem his relationship with his son, he knows that he is a dead man, he just wants to do the right thing at the end of his life. The relationship he and Shawn had is brought to life by the solid work done by Liam Neeson and Ed Harris. Their scenes together are sad but reflect a deep bond in spite of the circumstances. You will get a requisite amount of mayhem, but you will also get a tragic story of wasted lives and lost friendships. I loved this! And I had lowered my expectations, too. One of the best dark redemption films of the last few years, IMO. The family drama, on both sides of the equation hit home. You nailed it, Richard. Playing against his Bryan Mills persona, Liam does superior work here -- and all those films you listed are my favorites, as well. While the flashy camera work was a bit distracting, the in-joke when asking the kids on the street where that young witness lives, "What am I, Google Maps? ", kinda made up for that. Always great to have Ed Harris in a movie. Ever the pro, he's such a treat. Great review, my friend. Thanks Michael, I've been trying to talk this one up with anyone who will listen. It is so much better than the third Taken film. There is definitely a demarcation point between great Neeson action films and perfunctory feedback. Run out to see Run All Night everyone. Nice review. I know many dismissed it as just another Neeson early year action flick, but I have found myself really anxious to see this one. I think it is solid, there are some conventional plot elements but the are well integrated into the film Neeson and Harris have a couple of solid scenes that make it worth the investment of time. Thanks for stopping by Keith, let me know what you think when you see it.